Frank Sinatra is an original abstract celebrity painting for sale by artist Kent Paulette. This portrait of Ol’ Blue Eyes has colorful geometric shapes. Buy this modern art in small & large sizes on canvas. The background is blue and Frank Sinatra is in earth tones. The 20th century iconic figure is smiling and he is wearing a hat and tie. The style of this fine art has elements of Pop Art, Cubism, Expressionism, and celebrity portrait artist K. Paulette’s own unique organic style. The dynamic brushstrokes give this expressive Frank Sinatra painting movement and a bold energy. The celebrity icon from the Rat Pack has kind blue eyes. He was a famous singer, musician, and actor from the 1940’s and 1950’s. Kent Paulette did this creative Frank Sinatra portrait in May 2015. Before beginning this modern art, Paulette watched a video of Ol’ Blue Eyes in the studio recording It was a Very Good Year. 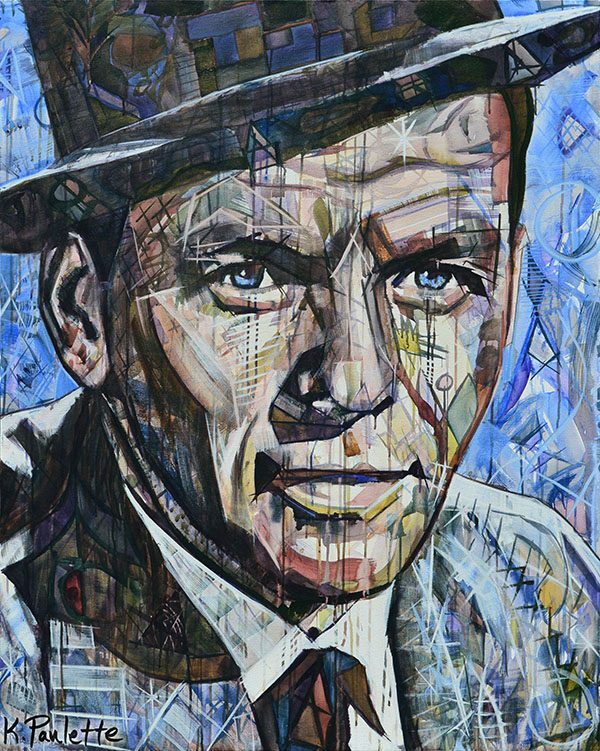 DreamOn3 Gala — A large version of this Frank Sinatra painting will be available at the silent auction during the 2019 6th Annual Dream Gala for Dream on 3 which will broadcast live on WBTV News. Kent Paulette is happy to answer any questions you may have. I purchased Kent Paulette’s painting “Appalachia Rising” in 2018 for our new home in Texas. I first saw the painting hanging at the Chef’s Table in Banner Elk, NC. Kent had it bubble-wrapped & securely boxed up & shipped within the week. I love it! Kent is an Amazing artist. He puts so much heart and passion into each and everyone of his pieces. I bought a deer picture for my house and received so many compliments even to the point I had someone beg me for it. I plan on buying many more. The paintings are truly unique and one of a kind. I highly recommend purchasing one of his masterpieces.